Third Window Films are all set to release the Korean film Han Gong-Ju on April 13th and I am excited because the reviews I have seen are positively glowing! I must admit that I have been in a bit of a slump when it comes to Korean films but I am anticipating this one being great and have watched a few recent releases so expect a review or two! Good day to you, dear readers! “I must say, Doctor Hill, I am very disappointed with you. You steal the secret of life and death and here you are trysting with a bubble-headed co-ed. You’re not even a second-rate scientist.” Herbert West. The film’s released this weekend look good! I had a binge session with movies watching lots over the course of the week. I got to watching plenty of Italian horror/giallo films and some random Asian ones that have been on my to-watch list since last year. The list includes Demons (ITA/GER, 1985), Deep Red (ITA,1971), Zombie Flesh Eaters 2 (ITA, 1988), Black Coal, Thin Ice (CHN, 2014), Broken (KOR, 2014), Inferno (ITA/USA1980) and a whole bunch of Hong Kong films. I’ll have to start watching Japanese films again… I have lots building up. 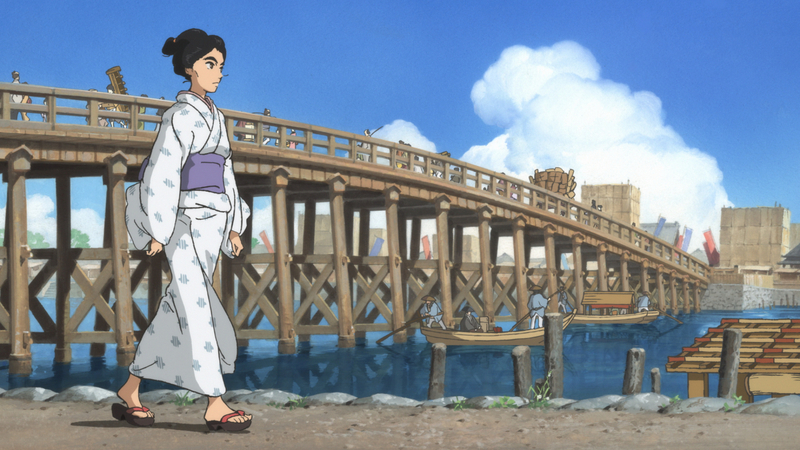 Plus there’s that season of Studio Ghibli films over March and April screening on Film4. 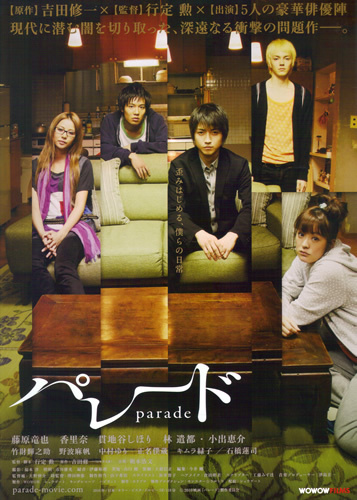 The only thing I posted this week was a review of the Japanese film My Little Sweet Pea (2013). Japan has always been good for films about women. It is thematic territory so rich in stories that there are genres such as the haha-mono (mother story). These are films that follow a specific formula where a mother figure endures a hard life and sacrifices herself for her (often ungrateful) family. Her suffering comes into focus in a teary-eyed ending where everybody cries and repents their actions, expressing the desire to change. Specific examples Keisuke Kinoshita’s tragic and bitter Nihon no Higeki (1953) and Yasuhiro Ozu’s The Only Son (1936), two films guaranteed to make an audience shed many tears of sadness. For a lighter one, try The Wolf Children (2012) which is about the struggles of a single mother with two unique kids (you will still shed tears but happy ones). My Little Sweet Pea falls into this genre but is different because it focusses on the children’s realisation of their mother’s sacrifice rather than the parent’s travails. Hello dear readers! I hope you are having a good weekend! I had a decent week. The start was a bit wobbly after watching Chappie (US/SA, 2015), a film I didn’t particularly enjoy much – I should have known better because I didn’t think much of the director’s previous film, Elysium (2013). Once I was back in work on Wednesday, the week was better and I did manage to watch a couple of really good films – Mahler (UK, 1974) and Lucky Jim (UK, 1957). That’s three more for my movies watched this year list! There are a lot of films of the list – thirty-seven so far, the majority of them western. I’m also enjoying finishing Ghost Hound, the latest episodes of Tokyo Ghoul Season 2, Parasyte, The Walking Dead and I Survived a Zombie Apocalypse. What did I post this week? 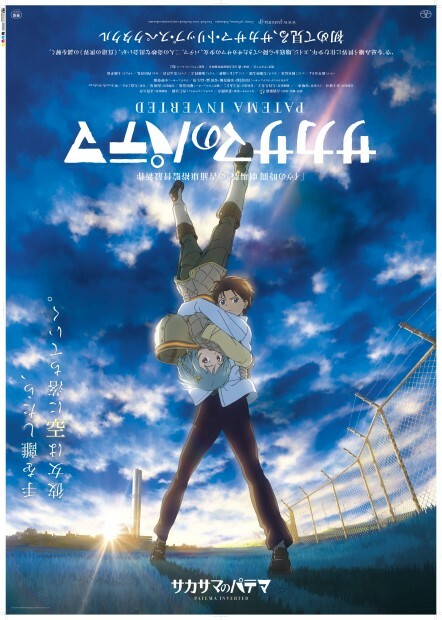 I posted a review of Patema Inverted (2013) and the trailer for Miss Hokusai (2015). 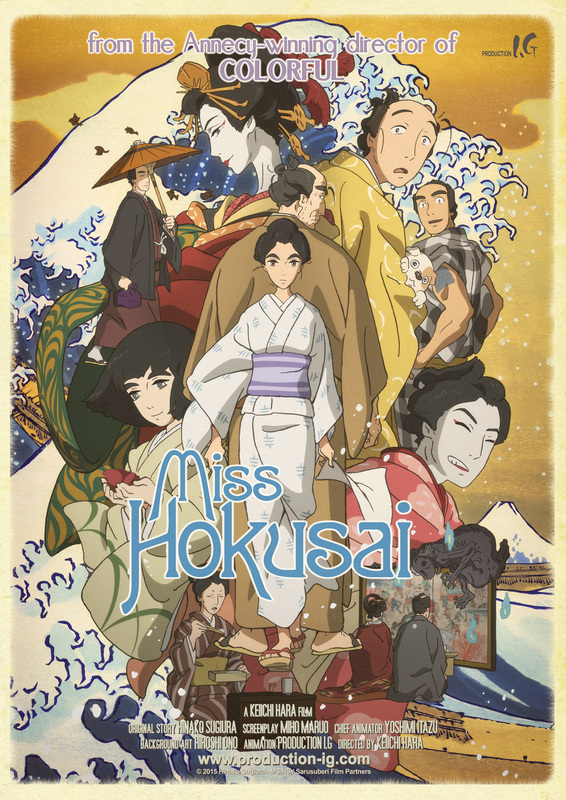 Last week I wrote a post about Miss Hokusai, an anime film that has caught my attention and I believe is worth checking out because of the talent involved and the early art work. Well now a trailer has been released and thanks to anime blogger beatslars, I have been alerted to the trailer which was reported on Anime News Network so here it is! 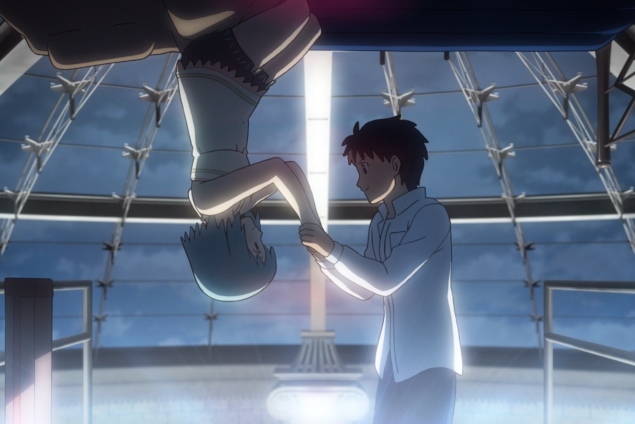 Patema Inverted is a story of boy-meets-girl only the writer/director Yasuhiro Yoshiura makes the phrase “falling head over heels in love” literal by twisting gravity around for the central couple so that they must cling together lest they lose not only each other but their lives… If protagonists getting their gravity mixed up is not a new and novel concept, it is one that is explored with much life and energy here in a deceptively light film where superb animation and imagination creates a world where ever shifting perspectives on life give a slight story much substance. 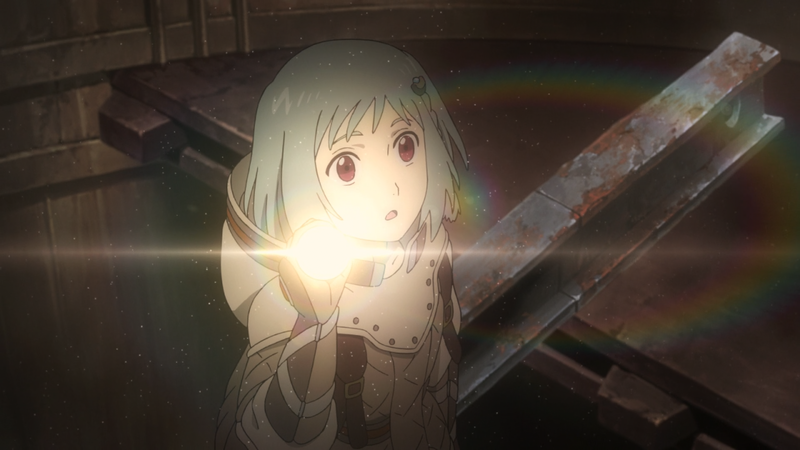 The girl in the pairing is the titular Patema, a brave princess of an underground village where the inhabitants, descendants of a group of scientists caught up in an experiment gone wrong, live in the tunnels and confined spaces of a scientific facility built long ago. I’ve had a decent week if you can count struggling through some awful writer’s block and trying to get a mammoth anime preview done whilst anxiously waiting for a romantic call decent. I’ve survived. Just about. Key in helping me survive was film. I watched the Italian horror films Tenebre (1982), The Beyond (1981), and Cemetery Man (1994) and I watched the British films Lair of the White Worm (UK, 1988), School for Scoundrels or How to Win Without Actually Cheating (UK, 1960), and the BBC documentaries Love Hotel (UK/JP, 2014), and Love is Everything: 100 Years of Love and Courtship (UK, 2014). Well. I’m going through my own courtship process with a lovely lady archaeologist at the moment and seeing how that last documentary showed love throughout the ages in Britain… well, it makes me slightly less fretful when waiting for my next meeting with my good lady. Gosh, I feel like a teenager again. Trying to distract myself from these feelings I wrote about the release of Miss Hokusai and a review of The Thieves (2012). A gifted con-artist is able to take in their mark with a solid sounding story and enough dazzle to distract. A con-artist can get away with anything especially if the audience doesn’t think too hard about the spectacle. 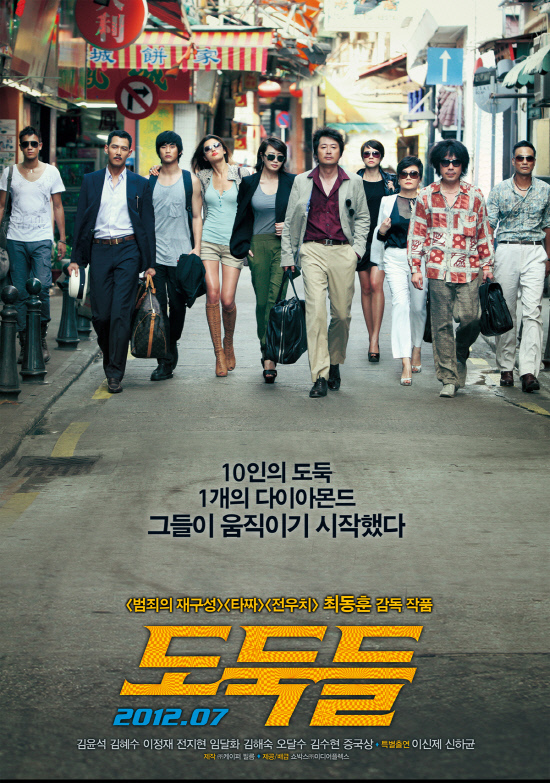 The same could also be said about films and so it proves to be true with the Korean mega box-office hit The Thieves (2012), from writer and director Choi Dong-hoon. He crafts a frothy and fun thriller but don’t look too closely or you might be able to see through the con and the story might not add up.